The CounterAct Convening will catalyze 880 creative actions to counter the 880 acts of sexual violence that happen in the United States every day (https://www.rainn.org/statistics/scope-problem ). Faculty, staff and students are encouraged to join us for any portion of the day. 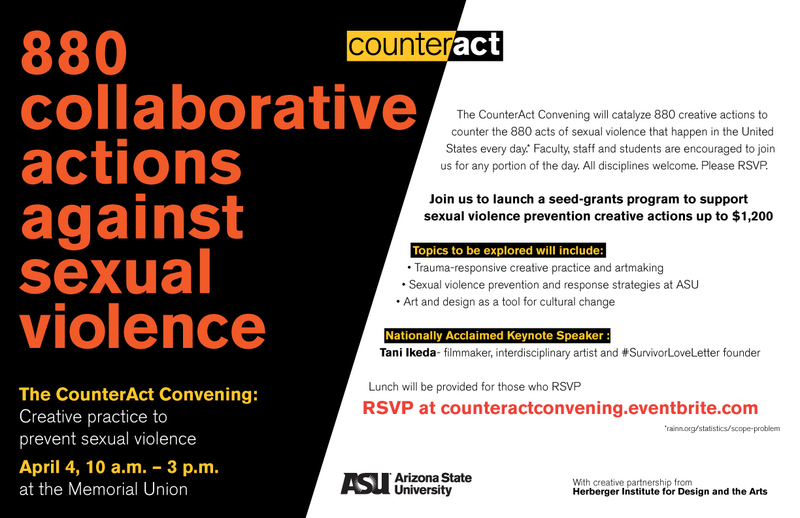 The convening will provide space for education, inspiration and partnership development as Arizona State University addresses this cultural problem with cultural solutions. The Convening will launch a seed-grants program to support small-scale sexual violence prevention creative actions. As a part of the convening, participants will collaboratively vision projects and curricular connections to propose to the seed grant program. All disciplines encouraged to attend. No arts experience necessary. Free event. Lunch is included for those who RSVP before March 28.